Hover over sections with your mouse to discover the development. Click into each area for more details about our office, retail, residential, parks and community sections. Our challenge is to enhance this prestigious area of South Dublin. And so, 150 acres of our 388 acre site are reserved for public parkland; featuring 3000 mature trees; running trails and playing fields – all those things that make life fuller and living together richer. With Dublin Airport just 35 minutes away, motorway access; a dedicated Luas stop and the city centre just 25 minutes from your door, getting away from it all has never been faster, or more convenient. Cherrywood offers the very best of South Dublin. 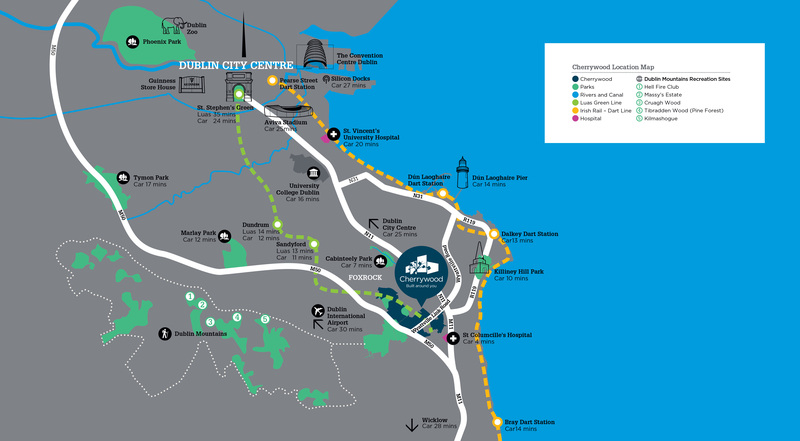 Situated at the foot of the Dublin mountains and just minutes from the sea, it’s the heartland of active living and just moments away from the bustle of city life.